L to R Nicholas Mongiardo-Cooper, Jason Maddy-Photo Credit: Aaron Rumley. Andrew Barnicle, Julian Diaz, Katie Karel, Richard Baird & Jacquelyn Ritz-Photo Credit: Aaron Rumley. 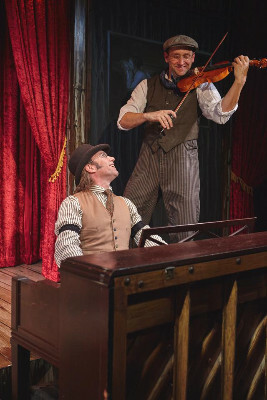 Lousi Lotorto at piano, Jason Maddy on violin-Photo Credit: Aaron Rumley. 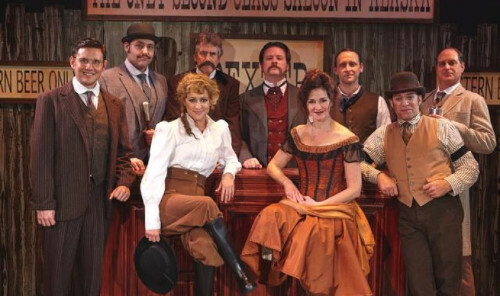 CAST L to R Front Row Julian Diaz, Katie Karel, Jacquelyn Ritz, Louis Lotorto;L to R Back Row Nicholas Mongiardo-Cooper, Andrew Barnicle, Richard Baird, Jason Maddy, John Tessmer-Photo Credit: Aaron Rumley. That being said, the challenge of correcting Sir Arthur Conan Doyle’s oversight became a bit of a mission for acclaimed playwright Joseph Vass to write a hoot of a comedy that celebrates not only the insertion of Sherlock Holmes as a character into his play, but sets his ‘who dunnit’ plot based on factual events during Nome Alaska’s Gold Rush period of 1899 to 1909. The world premiere production of Vass’ comedy/mystery “Sherlock Holmes and the Adventure of the Great Nome Gold Rush”, may be a mouthful to say but it’s easy to enjoy; so are the songs and music written and composed by Vass for the production, who is also a musician and is one of the driving forces behind the Klezmer music movement in the country. 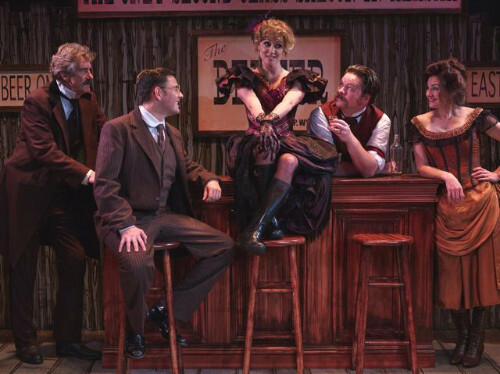 North Coast Repertory Theatre Artistic Director David Ellenstein, deftly stages his production with elan and assurance, lending an authenticity to the wild happenings on the stage. 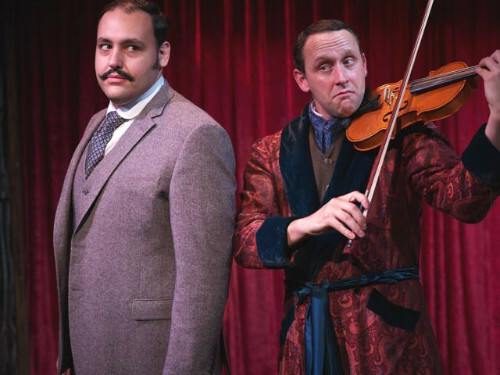 It is performed by a sensational Equity cast of North Coast favorites, including Jason Maddy who stars as Sherlock Holmes, the master of disguise, along with cohort Nicholas Mongiardo-Cooper as the redoubtable Dr, John Watson. A case the two are working on back in England to free an innocent man for a murder he did not commit, brings them to Alaska in search of additional clues, proof, and to collect a missing quit-claim deed to a highly successful gold mine. ‘Claim-jumping’ was a cottage industry – usually with the cooperation of the local politicians and law enforcement officials – in most of the gold mines during the late 1880’s and the turn of the 20th century. Former US Marshall Wyatt Earp engagingly played by Richard Baird, is now the owner, bartender, and security department of the Dexter Hotel, Saloon and “chicken ranch”. With Earp around, most of the denizens observe the House Rules…or else! Baird’s rich baritone also voices his English Solicitor role as Mr. Pike (M’lud) in a spot-on British accent worthy of an Earl. Earp’s main squeeze Josephine is the fetching Jacquelyn Ritz who lights up the stage with her entrance and plays Mrs. Hudson, Holmes and Watson’s housekeeper back at 221-B Baker Street, London. A terrific Louis Lotorto performs double duty as Ace Dolan and as Charles Valliere the piano player. Lovely Katie Karel plays Charlotte Valcour Amason, the lady with a vested interest in finding the elusive quit-claim deed to her husband’ gold mine; also Karel sports a full throated Mezzo Soprano in the bargain. Andrew Barnicle as Alexander McKenzie, is picture perfect as real life Alexander Mc Kenzie (a former Republican national committeeman and political figure from North Dakota) whose cowboy hat looked as if it could hold 20 gallons instead of the traditional 10 gallon head cover. Mc Kenzie is a formidable opponent for Holmes and Watson but we all know who wins in the end. “It’s elementary, my dear Watson” as the great man usually says at one point in all of his adventures. John Tessmer as Judge Alfred Noyes and Julian Diaz in multiple roles lend support to this entertaining production. If I had to find fault, it would only be to suggest that perhaps a couple of judicious cuts here and there might mitigate the feeling, on the part of some in the audience, that the play had a false ending (or two) and that it ran a tad long. The creative team led by director Ellenstein includes one of the best scenic and lighting design teams in North County in Marty Burnett (designer) and Mathew Novotny (lighting). The costumes by Elisa Benzoni ring true with period authenticity, and Hair and Wig designs by Peter Herman, along with a sound design by Matt Lescault-Wood, complete the technical team. “Sherlock Holmes and the Adventure of the Great Nome Gold Rush” performs at North Coast Repertory Theatre though February 14, 2016. Posted courtesy of Jack Lyons and Desert Local News.